Yesterday our local CI/TPRS met for the very first time! It was a historic event and I was just tickled pink! We had 6 teachers representing 4 different schools and I’d say we’re off to a great start! I was inspired by the incredible Rita Barrett (who just published her first novel!) and the lovely ladies in Portland who hosted Comprehensible Cascadia this summer. Rita urged me to get the ball rolling to connect with and support local teachers who are teaching with Comprehensible Input in their classes. If you’re looking for a local CI/TPRS group, check out this list here….if there isn’t one, maybe YOU should put a group together! Slow down! Our little darlings need time to sort out what we’ve said and extract the meaning. This takes so much longer than we usually give them. Say a word. Pause. Take a breath. Say another word or two. Point to the word on the board and give them a few seconds to read it’s translation. Then another two words. Go as slow as you can and then challenge yourself to slow down even more. Especially with you level 1s…if you go slow enough and they’re all tracking with you, it is totally magical. If you’re going too fast, it’s just confusion and frustration. If you’re not sure if you’re speaking too fast, film yourself during class. My trouble is that I get excited and I speed up… And I need to be reminded to SLOW the heck down! I think it was Susie Gross who coined this phrase which has been woven into the very fabric of CI teacher training. While you’re speaking slowly, watch their eyes! No duh, right!? But it’s so so so important! You will see who’s tracking with you and who’s asleep on a beach in La La Land. You can see the flicker of I don’t have a clue what’s going on! and the gleam of the kid who is totally immersed in the magic of understanding a new language. I think a lot of (other subject) teachers teach to the back of the room. They deliver their lecture without noticing what their little darlings are doing or learning. NOT US! Oh no! 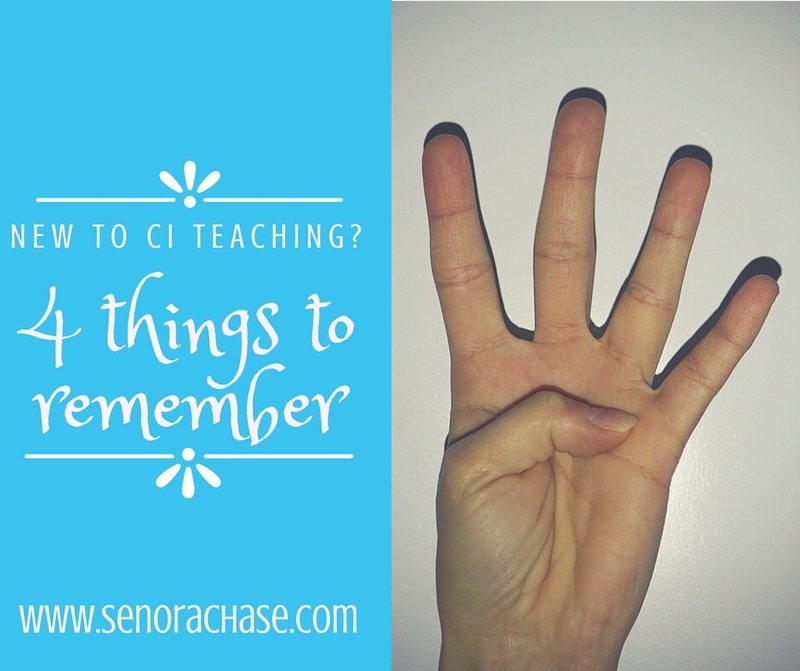 We teach students first, then Spanish (or French, Latin, Japanese, or…) second! Watch your kids, watch their body language. Teach to their eyes. Monitor your language. Think about which words they own and what’s going to be new to them. As you’re talking slowly, and watching their eyes, think about what words need to be defined. At the beginning, nearly everything (except really obvious cognates) will need to be written on the board with their translations. It’s hard to remember they know and keep that straight across different levels…by going slowly and really watching them, you’ll see when you become incomprehensible, when you’ve gone “out of bounds” by using unfamiliar words. Asking for a translation is another option. It’s the easiest and quickest way to know if they’re understanding you. If you and your students share a common L1, use it to gauge their comprehension. Sometimes I’ll ask the whole class for a translation. Sometimes I’ll call on students with my magic cards. Other times I’ll ask them to tell their partner what I just said (and I’ll conveniently stand by a pair that I want to overhear). If they’re not understanding us, then we’re all wasting out time, so stop and ask them, frequently! Just 4 things…that’s manageable, right? Just talk to your little darlings slowly, watch their eyes, use language they’re familiar with and check to make sure their understanding you. That doesn’t sound too bad, does it? You got this! Here’s to a fantastic year!